Mono Lake is one of the most photographed subjects in the Eastern Sierra, and for good reason. The placement of the lake often brings very interesting cloud formations that mix nicely with the otherworldly appearing tufa. On this particular evening that wasn’t the case. We arrived at Mono Lake shortly before sunset and were greeted by blank blue skies. Thankfully, after the sun had slipped behind the Sierra’s some faint color started to appear in the Eastern sky. It was very faint, so I chose to use a very long shutter speed to capture the color. I set my f/stop to 16 and adjusted the shutter speed until I was happy with the exposure. Next I attached my 10 stop neutral density filter on the lens, being careful not to change the focal length. I entered the original shutter speed into Filter Calc and computed a shutter speed of 74 seconds. The extra long shutter speed completely smoothed the surface of the lake making the scene seem even more alien. I liked how the foreground rocks mimic the shape of the tufa. 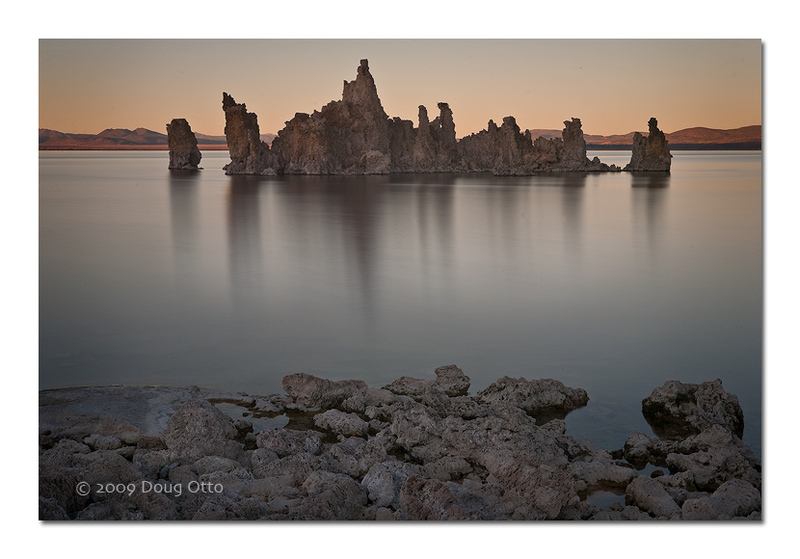 This entry was posted in Photography and tagged 10 stop neutral density filter, doug otto, eastern siera, Mono Lake, sunset, tufa. Bookmark the permalink.